The average age for injured [edit: achilles injuries] players was 29.7, with seven years of playing experience (Kobe's in his 17th year); in the first year back from injury, players played 5.21 fewer minutes per game. That number dropped to 4.42 in the second year back. More tellingly, player efficiency rating (PER) dropped by 4.64 the first year back and 4.28 the second. To understand how severe that drop is, consider: This year, a difference of 4.64 PER is the difference between Kobe Bryant and Ersan Ilyasova. On a per 40-minute basis, "athletic" stats like blocks, rebounds, and steals actually held steady post-injury. The same is true for field goal and free throw shooting percentages. Given players' dropoffs in overall efficiency, that was surprising, so I dug a little deeper and looked at rebound rates, free throw attempts, and other areas that might affect a player's PER. There is a general decline in FTA in post-injury years (which would pose a problem for Kobe, given how many shots he takes), with rebound rates actually holding more or less steady. The dropoffs showed up in any number of categories. Some players shot abysmally once they came back; for others, usage rates plummeted, suggesting they were no longer capable of creating their own offense. But taken as a whole, there was an obvious and expected drop in efficiency for nearly everyone. Chauncey went from a quality shooting guard option flanking Chris Paul to a liability. Expecting any sort of return to form is a fool's game. When Joe Dumars brought Billups back, the thought was that he could mentor Brandon Knight, helping the third-year guard to start approaching his ceiling. A few weeks later, Knight was gone, Will Bynum was re-signed, and Billups was once again destined for a bit role as a backup shooting guard and "glue guy". Few players make it back to their potential following an achilles tear. Even fewer do it at Chauncey's age. 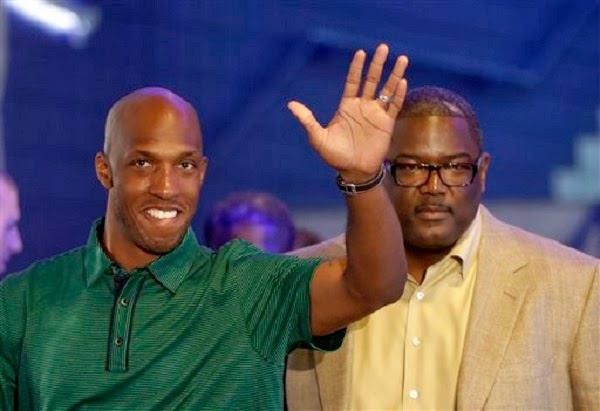 A two-year contract was probably the wrong move to sell a few jerseys, but Billups is likely being primed to take a seat on some team's bench with a clipboard in hand. Mo Cheeks appears dead set on this trusting veterans mantra, but that only lasts as long as the rookies aren't clearly better players. Until Kentavious Caldwell-Pope proves he can knock down threes with consistency, or Billups' crippled athleticism becomes a defensive liability, Chauncey is your starting shoot guard. Even with a blown tire, he can still stretch the floor, a necessary role in the Pistons' starting lineup. But even as the starter, his minutes will be limited. Chauncey will probably the first starter off the floor in most games, and Mo Cheeks will manage his minutes to get some production out of him at the end of games. For the front office, the return of Chauncey will sell some jerseys and function as a excellent PR move. For the on-court product, it probably doesn't mean much. Billups can act as a stopgap until KCP is able to start at shooting guard. His veteran experience should help the younger guards on the team, but I worry about Cheeks' insistence on playing veterans. If you would rather roll the dice with Billups late in games or in the playoffs, fine, but an over reliance on what appears to be a player in significant decline does not bode well for this team.